This security poster illustrates the PMR-3 Former Yugoslavia Anti-Personnel mine. This mine is a modern design of stake mines that uses a steel stake, and it is designed to allow the mine to be fitted upright, or upside down which makes the trip wire very low to the ground. This security poster features the technical specifications of the PMR-3 anti-personnel mine, illustrations and descriptions on how to disarm the PMR-3 anti-personnel mine, a PMR-3 with fuze pointing down and the safety clip in the safe position, a UPMR-3 fuze without safety clip, details of the aluminum angle stake, a new version of the PMR-3, and a PMR-3 with the fuze pointing up and the safety clip missing. A PMR-3 with fuze pointing down and the safety clip in the safe position. A UPMR-3 fuze without safety clip. New version of the PMR-3. PMR-3 with the fuze pointing up and the safety clip missing. Details of the aluminum angle stake. Illustrations and descriptions on how to disarm the PMR-3 anti-personnel mine. The technical specifications of the PMR-3 anti-personnel mine. 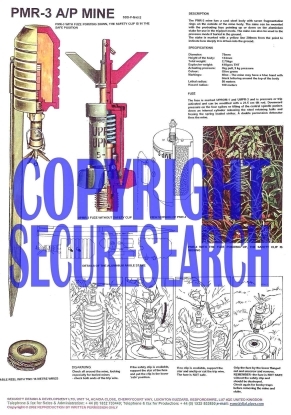 This security poster features the technical specifications of the mine, illustrations and descriptions on how to disarm the mine, a PMR-3 with fuze pointing down, a UPMR-3 fuze without safety clip, details of the aluminum angle stake, and a PMR-3 with the fuze pointing up.